• The first classical cookbook • • An accessible translation of an important fragment •This remarkable and almost unique work was written in the 4th century BC by the poet Archestratus, from Gela, a Greek colony in Sicily. The complete text has vanished but these fragments come from a much later book by Athenaeus. Archestratus’ description of the foods, particularly fish, available, how they should be cooked and where found in the best condition is testimony of the strength of the Mediterranean tradition. His cooking can best be called the nouvelle cuisine of the ancient world, and contrasts piquantly with the strongly flavoured dishes of Apicius. The Greek verse has been translated into prose and set in context in the introduction. Archestratus has been the subject of a major new edition by Olsen & Sens. However, its price is prohibitive and it is less accessible to people interested in the history of food rather than Greek prosody. An earlier edition was produced by ourselves in 1994. 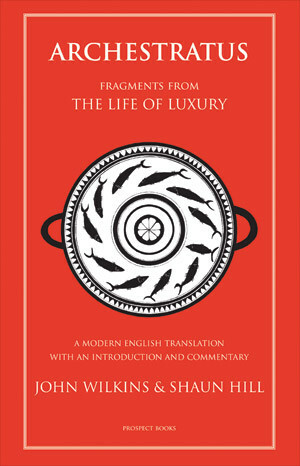 The Guardian commented ‘Shaun Hill combines the skills of first-class chef with a knowledge of classical literature to unerring effect, and with a sharpened wit.’ John Wilkins is Professor of Classics at Exeter University. He has a particular interest in food studies and was the joint editor both Athenaeus and his World and Food in Antiquity. Shaun Hill is a chef by profession though he studied classics at university. He has been much fêted for his cooking, receiving a galaxy of Michelin stars, and is currently at the stoves at The Walnut Tree Inn near Abergavenny. A PDF of the preliminary matter, part of the introduction to the first edition, samples of the main text, the bibliography and the index.